Author Press Kit – Do You Need One? What Goes In It? Being an author in 2017 is about a lot more than just writing your books. Whether you’re traditionally published or self-published, you have to be involved in marketing your books. Gone are the days of an author sending his or her book to the publisher and sitting back to wait for the royalty checks. (I don’t think those days ever actually existed, but it’s a nice image.) Today’s author has to be involved, intimately involved, in the marketing of their books and of themselves. That’s where your press kit comes in. A lot of the requests for information you’ll get will ask the same questions and need the same information. That’s where a press kit, or media kit, comes in. Create your media kit, and you’ll have a great resource you can send to anyone who asks for it, giving you more time to focus on your writing. All authors should have a media kit, whether you’re just starting out or have a backlist to rival Stephen King. The thing to keep in mind about your media kit, though, is that it needs to be concise, giving just enough information, but thorough, providing all of the information a blogger or publicist could possibly need. So what goes into a media kit? I talked about your headshots my post about your homepage. All of that information applies to the headshot or headshots for your media kit. If you can hire a professional photographer, that’s the best way to ensure your headshot is great. Have your hair and makeup professionally done. Try several different poses, different outfits, different settings. Do NOT use a selfie, unless you’re really skilled with using the timer on your phone and you can set up an actual shot. Try to make the theme of the photographs fit your book. If this is a business book, look professional. Fitness guru? Have your pictures taken in the gym. If you’re a chef, get in the kitchen. Etc. You should be the only person in the picture, unless you’re a writing team, then obviously all of you should be there. But if you’re a solo writer, you should be the only person in the picture. Feel free to have your dog or cat or iguana in there with you, though. Keep the background clear from clutter. If there’s a prop you want to incorporate, keep it up front with you so it’s clear that it’s supposed to be there and not something that was just left in the background. This was also part of the home page post. For the most part, the tips there work for your media kit, too. But there are a few more things to keep in mind. Ideally, your media kit will have 2 different bios, a short one bloggers or publicists can grab to include in an small bio section of whatever they’re doing, and a longer one that can be used for longer pieces. You can just create the longer bio if you’d like to, just be sure that the first paragraph is able to be lifted on its own and used for shorter pieces. A really good example of this is romance author Jessica Lemmon. You can see on her page that she has a longer bio on the left, and a shorter, paragraph-length bio in the center. If you’re looking for information on Jessica, you can use whichever of these bios fit what you’re working on. Have some fun with this. Like your headshot, the feel of your bio should match your book. If you’re writing a business book, mention your qualifications. If it’s a fitness or health book, tell a bit of your story; how you came to be in that industry. If it’s a novel, mention how long you’ve been writing, why this genre instead of a different one, etc. This is a chance for your reader to get to know something about you. Have you won any awards for your writing? This is the place to mention them. If there are one or two, just mention them in the bio. If there are more than that, add a list at the bottom of this section. This is also where you would include the name and contact information of your publishers and agents. Just their names and email is fine, you don’t have to include everything. If you’re publishing through multiple publishers, list all of them. These should be everywhere. Everywhere your name is, your social media links should be as well, and that includes your press kit. Wherever you hang out online, include that link. But only include links to where you actually spend time. It does no good to include a link to Instagram if you have 3 posts over there and they’re all of your cat. 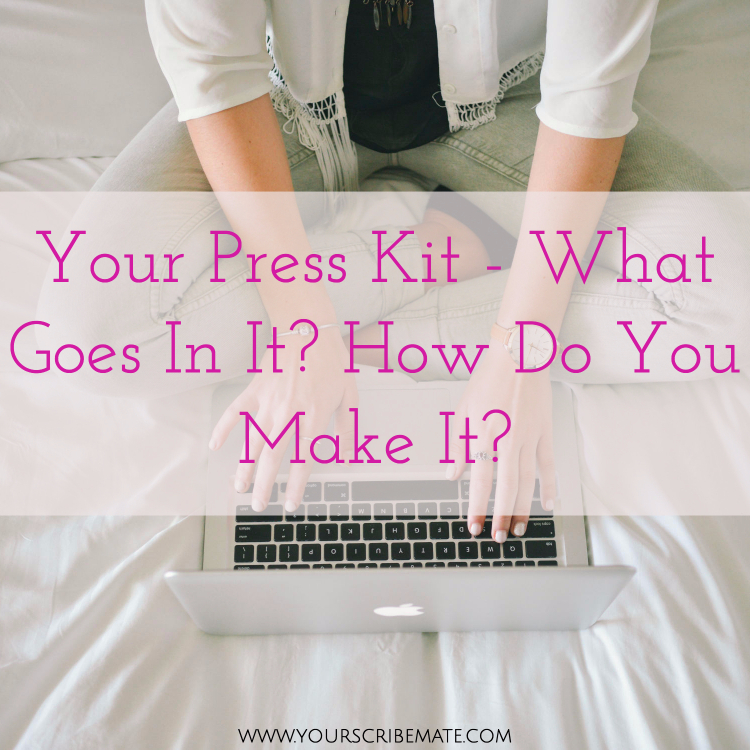 So now that you know what you’re putting into your press kit, how do you create it? Well, honestly, that’s up to you. You can use whatever program you’re most comfortable with. Whatever you can use to make a PDF will work. Whether that’s Microsoft Word, Canva, InDesign, Photoshop, Keynote, or something I’ve never even heard of, it doesn’t matter. Create the PDF, and use the same information to create a press page on your website. The layout is up to you – be creative! Incorporate your branding colors, your fonts, and your personality in the press kit; remember this is how your readers will get to know you. Keep in mind how you’re going to distribute your press kit. The best way to do it is to have a page on your site with the information, and a link to a downloadable PDF version. Also keep a PDF version handy for emailing it directly to anyone who asks for it. If you’re planning a launch for a specific book, there are a few other sections you’ll want to include, and that press kit will probably be more than one page. Come back next time to find out exactly how to set up that press release for your new book! Want this info in a handy checklist? Grab it here! And, hey. If you’re busy writing your books and don’t have time for this, hit me up in an email to heather@yourscribemate.com or use my calendar link to set up a time to chat. I’d love to help you out!